Malignant peritoneal mesothelioma is a rare type of cancer that occurs in the thin cell walls surrounding the abdominal cavity, known as the peritoneum. This thin membrane acts a lubricant within the abdominal cavity so that surrounding organs and internal body structures may contract and expand within their normal body function. Incidence of peritoneal mesothelioma is quite rare, and typically presents in less than 500 individuals in the United States each year. Other types of mesothelioma include the more common malignant pleural mesothelioma, occurring in the chest wall membrane surrounding the lungs, and malignant pericardial mesothelioma, which occurs in the pericardial lining of the heart. 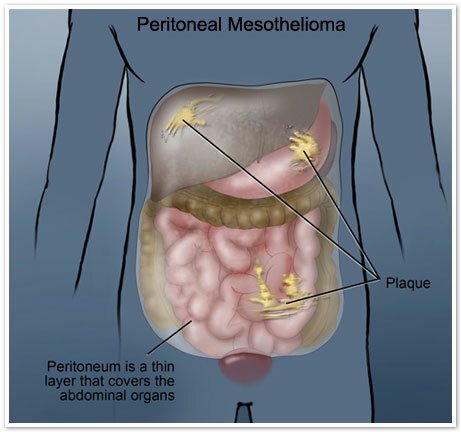 Peritoneal mesothelioma is the second rarest form of the disease and accounts for approximately 20% of all mesothelioma cases each year. Surgery is possible for patients diagnosed with earlier-stage disease. Some surgical options include peritonectomy and palliative procedures. Certain physicians, including Dr. David Sugarbaker of the International Mesothelioma Program at Brigham and Women’s Hospital in Boston, MA, have become extremely well versed and experienced in the surgical treatment of malignant mesothelioma. In many cases, surgical treatment for mesothelioma will be coupled with chemotherapy or radiation therapy regimens. Chemotherapy is the most common treatment for mesothelioma disease. Currently, there is only a single chemotherapy regimen (Alimta® (pemetrexed) in conjunction with Cisplatin) approved by the Food and Drug Administration as a prescribed therapy for the treatment of malignant pleural mesothelioma. There are however, dozens of clinical trials being conducted for mesothelioma patients experimenting with new drugs, including Gemcitabine, Navelbine, Onconase, and others for the treatment of malignant peritoneal mesothelioma. How is Peritoneal Mesothelioma Diagnosed? Doctors may suspect peritoneal mesothelioma if the patient complains of stomach, chest, or abdominal pain. Suspicious hernias may actually be a peritoneal effusion caused by peritoneal tumor growth. Misdiagnosis is common and patients will likely undergo multiple imaging scans and a diagnostic biopsy before an official diagnosis is made. Diagnostic procedures in which fluid is extracted from the peritoneum for lab testing are the only way to conclusively diagnose peritoneal mesothelioma. Samples will be examined for the presence of malignant cells. Once malignant cells are detected, further testing will be needed to classify these cells as malignant mesothelioma.